Equity markets continued to build on the positive performance since the beginning of the year and managed to end the first quarter of 2019 deep in positive territory. Dovish central banks policies across major economies and renewed hopes of progress in the US-China trade talks helped keep the markets afloat. The MSCI All Countries World Index added 1% during March to end the quarter with an advance of 11.6%, while the MSCI Emerging Markets Index added 0.68% bringing its first quarter returns to a little under 10% at 9.56%. As was expected, the FOMC summary of economic projections following the March Fed meeting showed a downgrade of the general outlook of the US economy. Real GDP for the current year and next is now expected to grow at 2.1% and 1.9% compared to December projections of 2.3% and 2.0%. The rate of unemployment is now expected to edge up to 3.7% and 3.8% in 2019 and 2020 compared to previous estimates of 3.5% and 3.6% respectively. Actual fourth quarter GDP for the US was revised down to 2.2% from a previous estimate of 2.6%. Real GDP for 2018 is now up by 2.9% compared to 2.2% for 2017. The deceleration in the fourth quarter reflects a slowdown in momentum caused, at least partially, by the fading effect of the tax cut stimulus and government spending. Manufacturing activity picked up in March as the ISM manufacturing PMI advanced to 55.3 compared to 54.2 in February. Inflation remained subdued with the Core Personal Consumption Expenditures (PCE) increasing only 0.1% month-on-month in January against expectations of an increase of 0.2%. On a year-over-year basis, Core PCE recorded 1.8% in January down from a revised 2.0% the previous month. US Indices had a solid quarter with the S&P 500 and Nasdaq Composite posting quarterly returns of 13.1% and 16.5% after a returning 1.8% and 2.6% in March. The Down Jones Industrial Average, on the other hand, remained practically unchanged at 0.05% during March and underperformed for the quarter with a gain of 11.15%. The 10-year Treasury yields declined steadily during the month, retreating from 2.75% at the beginning of March to 2.4% as of month-end hitting a 15-month low. Markets in Europe joined the rally with the Stoxx Europe 600 Index adding 1.7% for a first quarter performance of 12.3%. The German Dax and French CAC40 added 0.09% and 2.1% respectively bringing their first quarter returns to 9.16% and 13.10% respectively. Manufacturing activity extended its weakness as the Markit Manufacturing PMI for March declined further to 47.5 from 49.3 in February. European inflation remained weak as the headline Consumer Price Index (CPI) registered 1.4% in March against expectations of it remaining stable at 1.5% and the core CPI declining to 0.8% against expectations of 0.9% and a February reading of 1.0%. In the UK, equity markets seemed to ignore the chaos caused by the Brexit as the parliament rejected the Prime Minister’s plan for the third time. The FTSE 100 advanced by 2.89% during March boosting the first quarter performance to 8.2%. Recent data showed that the UK GDP advanced by 0.2% during Q4 of 2018 bringing its overall growth for last year to 1.4%. Industrial activity, on the other hand, picked up markedly during March with the Markit Manufacturing PMI climbing to a 12-month high of 55.1 up from a revised 52.1 for February. Japanese equities underperformed most developed markets during March as the Nikkei 225 Index retreated by -0.84% resulting in a first quarter performance of 5.95%. The Nikkei manufacturing PMI improved marginally compared to the previous month but remained below the 50 level at 49.2. Unemployment, on the other hand, improved to 2.3% in March compared to 2.5% for the previous month. Emerging markets were mostly up during March. The MSCI Emerging Markets Index rose 0.68% during the month boosting its performance for the first quarter to 9.56%. MSCI Asia Ex-Japan Index added 1.52% during the month pushing its Q1 returns to 11.21%. Notable decliners included Turkey as the Borsa Istanbul 100 Index declined by 10.3% shrinking its year-to-date return to 2.75%. Russian equities advanced by a marginal 0.48%, while Asian markets were mostly positive with India’s NIFTY 50 and Shanghai Composite leading with advances of 7.70% and 5.1% respectively. Meanwhile oil markets continued their recovery and posted their strongest quarter in almost a decade. Markets were supported by the OPEC+ production cut, tensions in Venezuela, and renewed pressures on Iranian oil exports. Brent closed the quarter at $68.4/bbl, up 3.6% in March and 27.12% for the quarter. WTI ended March at $60.14/bbl, adding 5.1% during the month and 32.44% over the first quarter. GCC markets had a solid month overall. The S&P GCC Composite added 2.93% supported by robust performance in Saudi and Kuwait. The Tadawul All Share Index advanced by 3.85% for a year-to-date gain of 12.7%. Boursa Kuwait All Share Index, however, was the clear leader with a monthly advance of 7.38% boosting its returns so far this year to 10.6%. 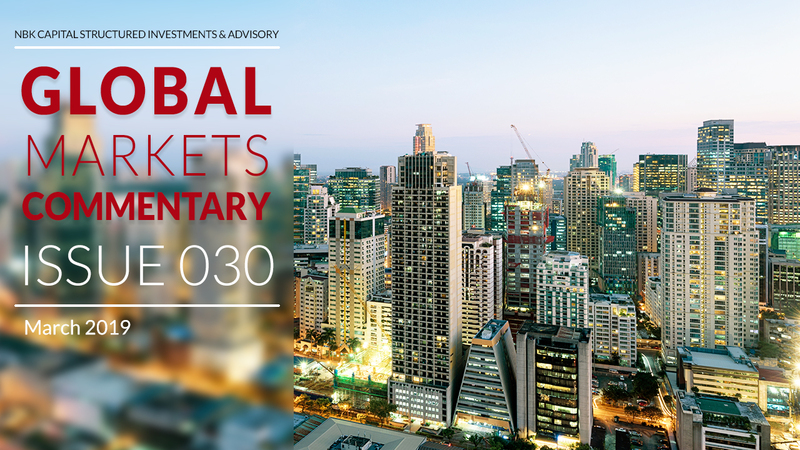 After a solid performance in February, the UAE markets took a breather with Dubai DFM general Index virtually unchanged at -0.03% and the Abu Dhabi ADX General Index down -1.23%. Both Indices are still positive for the year with 4.15% and 3.25% respectively. The broader S&P Pan Arab Index managed to advance by 2.31% during March despite the marginal decline of -0.45% in Egypt’s EGX 30 and declines of -2.07% and -3.14% in Morocco and Jordan respectively.